Crazy About Costumes: 23Skidoo 1920s Shoes! One crazy girl and her crazy costume dreams. 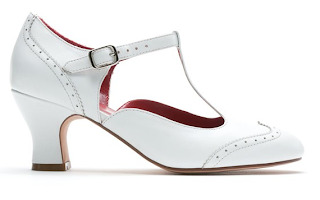 Pre-orders are open for gorgeous 1920s reproduction shoes by American Duchess. I can't wait to get a pair for myself! They also come in brown/white. One girl. One blog. Infinite costumes. Documenting the ups and downs, successes and failures, and all the pinpricking that goes along with being a costume maker. Bandaids are standing by.